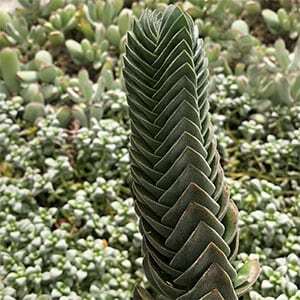 This is a fascinating species that initially grows in columns before branching, the coloums of Crassula ‘Buddha’s Temple’ grow in a rectangular shape. Although grown for the foliage,’Buddha’s Temple’ will flower, small orange to red bloom appears on top of the column. Eas care when grown in containers indoors of in a protected position outdoors. Best grown in a container and a specialist cactus and succulent potting mix. Good filtered light to full sun depending on the climate. Watering is best from below to protect the foliage collecting water and from marking. Repot every second year to replenish the growing medium. Fertiliser is not generally required if repotted regularly. Position – Good filtered light to part sun. Foliage – Green and tightly stacked. Flowers – Orange to red fading to pink.